How are fruit trees pollinated? Most cultivars of apples, pears and plums are, in the main, not self-fertile. This means that in order to produce fruit, these trees need to be planted close to one or more suitable cultivars in flower at the same time. To help with this, fruit trees are grouped according to when they flower and this is marked on the label when you buy a tree. Trees in the same, or adjacent numbered group should be selected. When the blossom is out insects, such as bees, are therefore able to cross-pollinate the trees as they buzz around looking for pollen. Even trees that are self-fertile will produce better quality fruit in the presence of a pollinator. But when you buy your tree, watch out for any that are labeled ‘triploid’. These cultivars will need two trees around them. Triploids have sterile pollen, so they’re not very good at pollinating the trees that pollinate them. So you need one tree to pollinate your triploid, and another tree to help pollinate the pollinator! Another option is to graft a branch or two from a variety of the same pollination group onto the tree – this could be a useful method for those with little space. Is everyone still with us? What trees should we plant together? Blossom begins as early as March or April, with plums and damson flowers appearing first, then pears and cherries. Apples flower through April and into May. Quince and medlar trees flower last. When it comes to apples and pears, the best way to ensure a harvest through the season is to have a mix of groups of trees that fruit at different times – matching trees that flower really early together with some that flower through the summer and early autumn and then really late varieties. Classic early apple varieties are ‘Beauty of Bath’, ‘Discovery’ and ‘Irish Peach’ – so good for planting together. While mid-season companions would be ‘Charles Ross’, ‘Cox’s Orange Pippin’ and ‘Egremont Russet’. A full list of apple and pear pollination groups can be downloaded from the RHS website. Do you believe that community orchards can be transformative? That they change places for the better and bring people together? Why are Orchards Priority Habitats? When Should You Pick Apples & Pears? 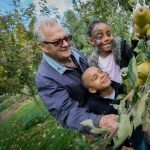 Bringing orchards into the heart of urban communities.